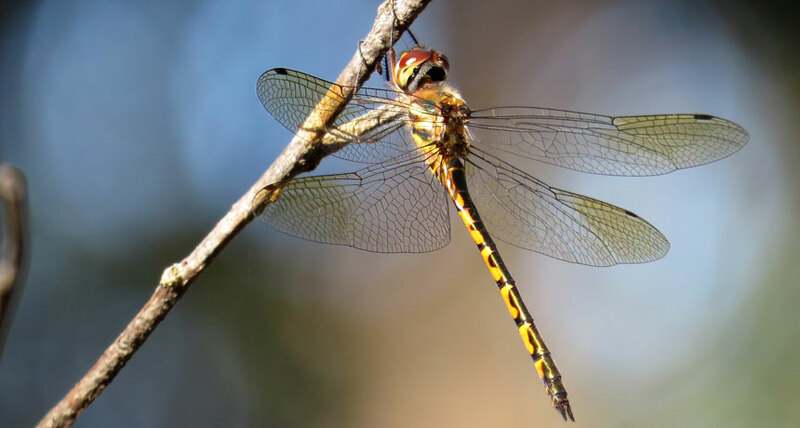 GOSSAMER WINGS Thin veins form different patterns on each dragonfly’s wings. Scientists have explained mathematically how these sections may form. The dainty veins gracing the wings of dragonflies and other insects are like fingerprints: Each wing displays a distinct pattern. A randomized mathematical process may help explain how certain thin filaments, called secondary veins, form these complex patterns, a new study finds. Insect wings consist of two types of veins, both of which provide structural support (SN: 6/24/17, p. 5). Primary veins, which tend to be long and relatively straight, are found in the same locations on the wings of each member of a species. But the smaller, secondary veins appear in slightly different places on every wing. Together, these two types of veins section off the wing into a multitude of tiny pieces, like bits of a stained-glass window. Scientists characterized 468 wings from 232 species by calculating the area of each tiny section, and quantifying whether it was circular or elongated. In a mathematical simulation, scientists recreated the shapes of dragonfly wings sections formed by primary veins (black lines) and secondary veins (red). The shapes of sections in a simulated wing (right) mostly matched a real one (left). A particular series of steps re-created the wings’ patterns, scientists report September 17 in Proceedings of the National Academy of Sciences. The team started by simulating a scaled-down wing, to mimic processes happening while the insect is developing. First, the placement of primary veins divided the wing into large regions. Then, the researchers randomly selected evenly spaced locations, termed “inhibitory centers,” within each wing region. In a real insect, these inhibitory centers might correspond to places where a chemical cue prevents the formation of veins. Researchers then selected locations for secondary veins via a mathematical mechanism called a Voronoi tessellation. It sections off a region around each selected inhibitory center such that every spot inside a section is closer to its inhibitory center than to any other. Finally, the wing grows, stretching the sections and making some regions more elongated.